Would you like to plug in a screaming Jumbo Jet to the other end of your tiny iPod? If you fly Air France, Continental, Delta, Emirates, KLM or United, you can. Only on any one of these six airlines can, “travellers power their iPods during flight and even watch their iPod movies and TV shows on their seat-back displays," says Greg Joswiak, Apple’s vice-president of worldwide iPod product marketing. More than 70% of automobiles launched in 2007 offer connectivity to the iPod. In fact, more than 4,000 accessories are made specifically for the iPod, from audio equipment and vehicles to fitness gear and more. Ironically, the one thing I quite dislike plugging into an iPod is a pair of ears. Irrevocable damage can be done to anybody’s sense of hearing with an iPod or music player set at dangerously high levels. In contrast, what excites me most about the MP3 player revolution is how my personal lifestyle and space are redefined by just plugging in speakers to an iPod. I don’t need racks of cassettes, stacks of CDs and an ugly-looking boom box or a complicated stereo system to listen to thousands of hours of music. Personal hi-fi amplifiers and speakers have shrunk to incredible form factors. Your living spaces can be redefined just as easily. Check out the style and specs of the Apple iPod Hi-Fi that retails for $49, at www.apple.com/ipodhifi/. Though great on sound, and given it can recharge your iPod, I found the JBL Radial far more appealing with its dramatic design. It looks like a giant engagement ring studded with speakers, with an iPod neatly plugged inside. An aesthetic remote control works from more than 20ft away using radio waves. The Radial connects to your TV, projecting photos and videos directly from the iPod. Available for $99.95 at www.jbl.com. Do check out the newer model called JBL On Time, which includes a clock radio and a digital interface. The ladies in the house may just fall for the JBL Spyro. 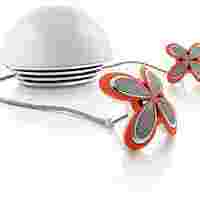 Two flowery-looking satellite speakers delicately prop up on a leaf petal, while an alien-looking semisphere shields the subwoofer. Available in fuchsia, teal, black, and white with orange spots at just $129.95, this is going to make heads turn. The SoundDock from Bose speaks of unstated, quiet elegance and style, and uses Bose’s proprietary acoustic engineering to faithfully recreate sounds from the compressed formats of your digital music. The unit retails for Rs17,888. The remote ships for another Rs1,461 and, disappointingly, works on infrared and not radio waves. More details on www.boseindia.com. Creative offers a range of speakers, but the TravelSound Popz caught my eye. The size of an ostrich egg, this sensitive device unfolds to reveal the two speakers and connections for your player. Impressively, it requires no batteries or additional power source and powers itself with just the audio output of your audio device. The sound quality is somewhat lacking, but overall it is quite convenient for travellers, especially with its price tag of Singapore $49. The TravelDock 900 looks like a case for a pair of sunglasses, the device unfolds to display NeoTitanium speakers. Four AAA batteries claim to give it 32 hours of powers, however, even at $45.99, the frequency response is rather weak with bass sounds. The TravelSound 400 swivels its speakers a full 180 degrees, delivers richer sound and a wide stereo effect further enhancing the sound, all this for Singapore $99. What sets Creative apart are its innovations in sound delivery. Check out the xDock or the xMod wireless devices, at www.creative.com. Logitech’s Audio Station, at $299.99, does a much better job with bass sounds, thanks to a long-throw woofer, while a soft-dome tweeter takes care of the rest. Do check out their mm50 Portable Speakers that ship at $149.99, and their AudioStation Express, at $79.99, for options in delightful sound. The diversity of speakers seems to have no end. Some retailers in the US offer water-resistant speakers for your shower, and ThinkGeek offers an MP3 pillow that uses batteries to play sounds from an embedded speaker:www.thinkgeek.com/electronics/mp3/8b18/ at $19.99. You may also find the reviews of around 70 speakers at www.ipodspeakerreviews.com useful. Personally, I look forward to the day I can connect my iPod to the Shatabdi train to Amritsar and listen to my favourite bhangra music en route to Punjab’s holy city.